Theodore Roosevelt Jr. is a name synonymous with the idea of hyper-masculinity for many Americans. As the 26th president of the United States, Roosevelt had a larger-than-life persona and many interests outside of politics for which he is equally famous. These interests include hunting, exploring, environmental concerns, and writing. One of his main interests throughout his life remained politics, and as the leader of the Republican Party and Progressive movement, he achieved a great deal during his presidency, including winning a Nobel Peace Prize. As a child Roosevelt was often sick, and he suffered from asthma. He was home-schooled because of this, and from an early age he developed a strong interest in nature. His early childhood illnesses seem to have directly contributed to his later love of physical exercise as well as the outdoors. Roosevelt attended Harvard University and studied biology. After graduation, he immediately went into politics and was elected to the New York State Assembly. At 22, Roosevelt married Alice Hathaway Lee, his first wife. She died of Bright’s disease after giving birth to their daughter. The same day, Roosevelt’s mother died of typhoid fever. The deaths of the two most important women in his life, both on the same day, deeply affected Roosevelt; he subsequently retired from politics and became a rancher. In 1886 Roosevelt remarried. His second wife, Edith Kermit Carow, had five children. After his brief foray into ranching, Theodore Roosevelt returned to politics and held various political and military positions, including governor, vice president, and volunteer and founder of a cavalry regiment during the Spanish-American War named the Rough Riders. After William McKinley’s assassination, Roosevelt assumed the presidency and championed the causes of trust busting and the regulation of businesses. He was re-elected in 1904, the first president to be re-elected after an assassination, and forged ahead with the building of the Panama Canal and ending the Russo-Japanese War. After his presidency, Roosevelt traveled extensively throughout Europe and Africa. 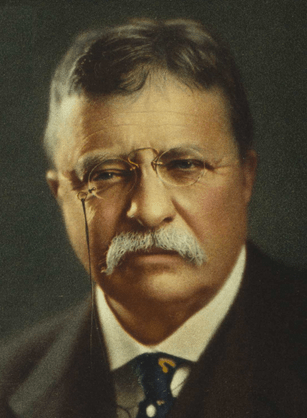 One of Roosevelt’s nicknames was “Teddy,” and the teddy bear was named after him. Roosevelt wrote many books with subjects ranging from history to hunting to politics. In 1882, he published his first book, The Naval War of 1812. Roosevelt believed strongly in a separation of church and state — so much so that he chose not to swear on a Bible during his inauguration. Being an ever-athletic president, Roosevelt was interested in a wide variety of sports, including boxing. In fact, at 50 years old, he sustained boxing injuries that left him blind in his left eye. These injuries occurred while in office, though they were a secret.